Sorry, but do you know what tacos are? Hola, it’s Eli. 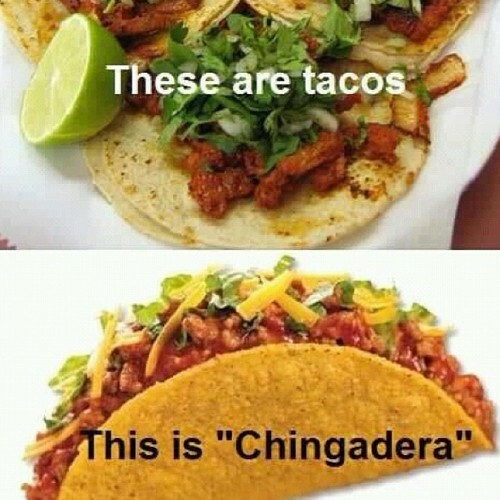 I have noticed a big misconception in the USA about what tacos are. Westerners percieve these holy objects as a glorified tortilla chip with cheddar cheese, lettuce, ground “beef,” and possibly some sauce from an amusing packet. This is a LIE, a fabrication propegated by the media, the food industry, and Hot Topic. Not only are these abominations an insult to the true taco itself, but in the words of Jeffery Allen, “Immediate gastro-intestinal Jihad.” (Web) Today I will tell you what real tacos are and how to find them. At this time last year, I was in rural Mexico. Why doesn’t matter, because I don’t even know. All I know is that I found out what my favorite food on the planet is: the taco. Real tacos, my friends, are not found in a Taco Bell. Real tacos consist of the following: a corn tortilla (soft), beef/pork/fish/intestine, onions, cilantro, salsa, and some lime. The tortilla is briefly warmed on the stove in animal fat, the meat is fried or shaved from a spit, and condiments are thrown on in a timely fashion. Additionally, beans, guacamole, cucumber, radish, and whole fried jalapenos compliment tacos well. The taco is best enjoyed outdoors at a taco stand, by a dirt road, and with stray rabid dogs running about. This can be a tough find in the USA, so let me present to you the second best. Here in Denver, there are some dope taco joints along Federal. You want to look for the hole-in-wall places, the sketchier the better. Ideally, you want to be in imminent danger of being shanked or having your car stolen. The tacos below are from Tacos Junior, a restaurant attached to a Mexican market. Located at 1951 S Federal Blvd, this place has solid tacos at a fair price. Order tacos de asada and adobada, then try the rest on your own accord. The saddest part of the taco is that it is a hidden gem. Most people don’t know what they are, and settle for disgusting westernized muck. Please, do yourself a favor and go eat some real tacos. You won’t regret it, and you will never return to the bastardized “taco” again. Jeffy, Allen. “How To Get Laid When You Live In the Middle Of Nowhere.” YouTube. YouTube. 21 Jun. 2008. Web. This entry was posted in Eli and tagged denver, federal, food, real mexican tacos, real tacos, tacos. Bookmark the permalink.